Throughout my adult life, personal and professional developments have always been tightly bound together and have in many ways informed each other. During my years at high school, I illustrated a monthly journal, which was displayed for everyone to read. It contained poetry, literature and contributions from the sciences. One of my teachers was also a journalist and took some of my illustrations to be published in a national magazine in Baghdad. Following this breakthrough, other writers and journalists frequently asked me to design illustrations. This gave me the idea to open my first exhibition on May 24, 1984 in the Kurdish town of Hawler. The governor of Hawler bought a collection of my works from this exhibition to be shown in the main library in the town, where it can be viewed to this day. After the success of the exhibition I went to Baghdad to study in the College for Traditional Woodcraft for one year. One of my artworks, a wood sculpture, was entered by my tutor for the 10th International Art Exhibition. During my year in Baghdad, political repression against the students (especially the Kurdish students) increased and, as I refused to become affiliated to the Baath party, I had no option other than to return to Kurdistan. This coincided with the war between Iraq and Iran and I faced forced conscription as a soldier in the Iraqi army. I decided to join the Kurdish resistance in the mountains, where artists had formed the Artists Mountain Association. There I designed political posters and illustrations to articles of ‘Kultur’ magazine. After the chemical bombardment of Halabja all our area was occupied by Saddam Hussein’s troops, and I along with thousands of others were forced to flee to Iran. I stayed in the Kurdish Iranian town of Saqis, where I continued to publish our magazine. Many of the Kurdish children, who had been orphaned in the bombing of Halabja and other towns, had been brought to a camp near Saqis. I worked with these children to draw and paint their memories and experiences and we later exhibited their work in the Museum for Modern Art in Teheran. 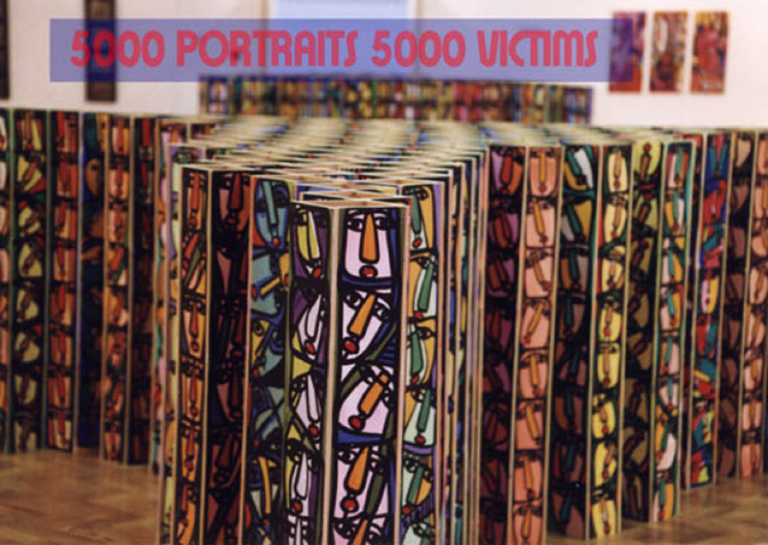 My artistic work was mainly concerned with showing the effect of the war on the population.The Iranian government published my artwork and it was shown in two major galleries in Tehran in 1989. With another artist friend I obtained a visa to go to Paris to open an exhibition about Halabja. This took place in the Kurdish Institute under the title ‘Kurdish Hiroshima’. Le Monde Diplomatique published an article and Channel Plus interviewed me the day after the exhibition opened. As an artist I became a witness to the crimes committed against my people. In the way that history affected my personal life, it also affected my artistic vision. In France I began to collaborate closely with two other artists (the French artist Edith Henry and the Polish artist Karina Waschko). Together we formed the organisation ’Showering of Birds’. This organisation has been actively involved till now in promoting the cause of international modern art in exchange with Kurdish artists. I escaped war and violence to face another kind of violence: life in exile. Becoming an exile is a violent act of psychological displacement. It entails rupture in one’s social and physical environment, in the pursuit of goals and in one’s continuity and history. It is separation from the groups one belonged to and the replacement of the familiar with a new world full of uncertainties. You have to make an effort to find new groups to identify with and to engage with your environment in new ways. The initial reaction to these changes is bewilderment and shock. Separation from the familiar environment and deprivation from the support and comfort of friends and family is accompanied with the challenges of adapting to a new world. My work defines my narrative, it transforms my past and present into themes and motifs that embody, justify, and explain my presence in that delicate space called exile and my suspicious identity as a refugee whose living depends on human understanding and the good will of others. I did not intend to reduce my identity to a man begging for compassion and understanding as an exile. I did not want to reduce all my values to humanitarian values of compassion and sympathy. I wanted to find a language that, while trying to find a channel of communication with my sceptical audience, also reasserted my identity as a Kurd and related my story as someone who had been victimised for nothing but for being a Kurd. In July 1987, when Sergelou (the village where I was based as a peshmerga) was gassed by the Iraqi government, I witnessed the blind birds falling from the sky, smashing against houses, trees, rocks, people. That day I promised myself to bear witness. I wrote in my diary addressing the birds: “If I am not like you, a lost story, I promise to tell the moving story of all the Kurdistan birds to all humanity in order that we might understand better the voiceless screams of my grieving country.” This was the basis of my exhibition ‘Birdshower –Balindabaran’, which has been touring France for the last 20 years. Using the face as a pictorial element has always been a persistent presence in my work. The dominance of the face over other forms in my work is partly related to the artistic traditions of the ancient Mesopotamia, which gave special sacredness to heads and faces of their gods and kings and depicted them in different ways and through different materials such as pottery, ceramics, and wall painting. The remaining heads and faces would be seen by the later generations as expressions of normal people and embodiments of blessing, goodness, fertility and hope. The particular way in which this artwork was displayed in the gallery space of Pitshanger Gallery in London in 1997 exemplified the importance of ‘framing’ the work to make it more accessible to a Western audience in a European art context. 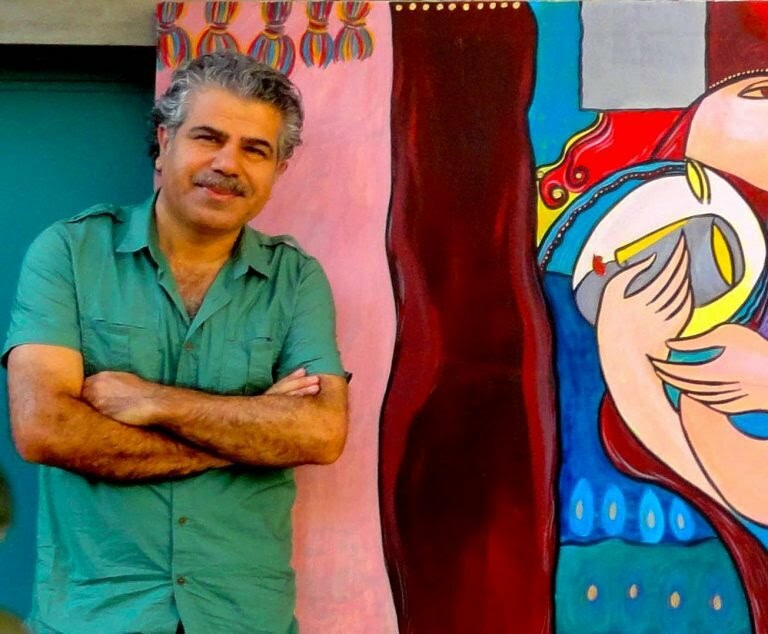 How an artwork can be interpreted in a cross-cultural context has become of greater significance to me in my art practice over the years of living in exile. My project ‘Colour and Word’ began in 1999 as an MA Fine Art project at Middlesex University (see Illustrations 6 and 7). I sent 700 A5-size mixed media artworks to poets around the world, asking them to be inspired by the images and to respond in form of writing on the original artwork. 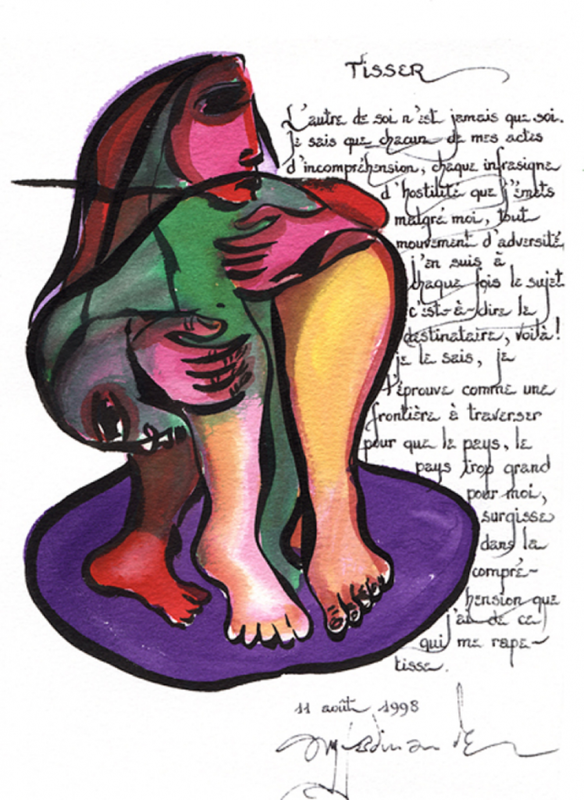 The concept of the project was to bring together colour and word as symbol for artists in exile. Around 350 responses by poets and writers from Europe, USA, China, Asia, the Middle East, Australia and Africa were collected and exhibited at Middlesex University Gallery, Brunei Gallery, Pitshanger Gallery and Riverside Studios in London. 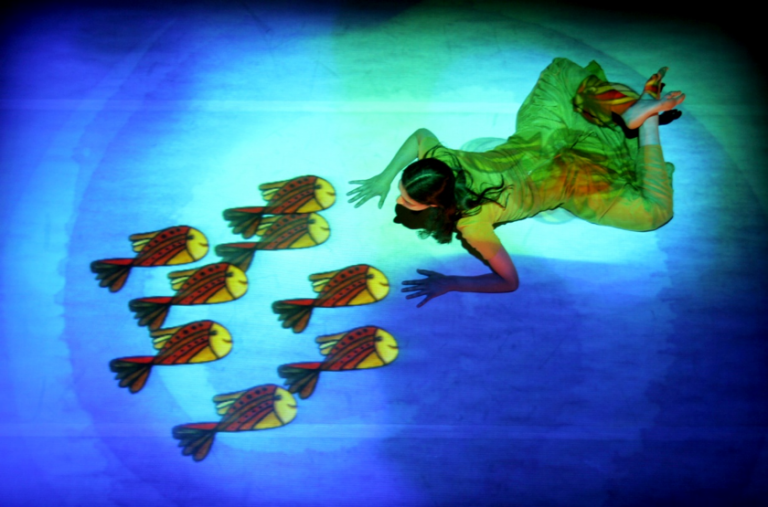 It became a touring exhibition in France, Belgium, Germany, Holland and the USA with workshops and performances. 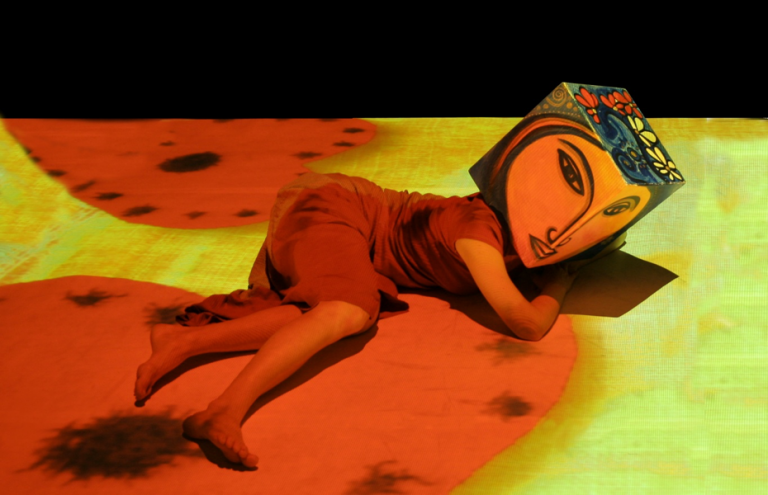 In 2003 a collaboration between the Italian company TPO (Teatro Prato Organisation), the Lyric Theatre in Hammersmith and myself began with the creation of the ‘Kurdish Garden’ (see Illustrations 8 and 9). Writing in the catalogue for the theatre performance, Sarah Schofield argued that ‘Rebwar’s artwork and the stories in The Kurdish Garden reflect his feelings and memories of Kurdistan. Rebwar remembers how beautiful and colourful life was before the war and the colours he uses reflect Kurdish life and nature, the earth, the rivers, the rugs woven by the women and the clothes they wore, the leaves and flowers and memories of those he loved.’ In the Kurdish Garden the audience is led into a digitally created world of astonishing sounds and images, where every movement that is made alters the visual display as the virtual garden bursts into bloom, colour and life. ‘Anfal 20th Anniversary’ was shown on the floor of the gallery at the Chocolate Factory, Middlesex University (see Illustration 10). One should have a feeling of visiting the graves: twenty canvases underneath the facial casts gave a sense of oneness of all the victims. I consciously used the method of repetition in this and other projects dealing with Anfal, where the work is part of the process of paying homage to the victims, a process that gives the audience a sense of calmness to remember the victims. The same form, repeated over and over again, is meant to halt, arrest and pause the viewer for a moment. Within that space of timeless repetition there is, however, difference – within the same forms are different expressions and lies a different identity. In general, as part of recreating my past experiences in the new place and time of exile, I attempted to re-use abandoned materials. The memories of war and destruction were captured in a new aesthetic recreation which transformed them into a new modality representing the positive endurance of art and the persistence of the stories of unknown victims. In a similar fashion I made use of letters and photographs of friends who lost their lives in the war. In 2009 I was invited to participate in the Kurdish Pavillion at the Biennale di Venezia (7th June – 22nd November). The event attempted not just to present the works of participating artists but also to create an environment in which the artists had the opportunity to make a clear statement on the complexities of the Kurdish context and to reflect on elaborating a cultural identity for Kurdistan (see Illustrations 11 and 12). (Illustration 12). 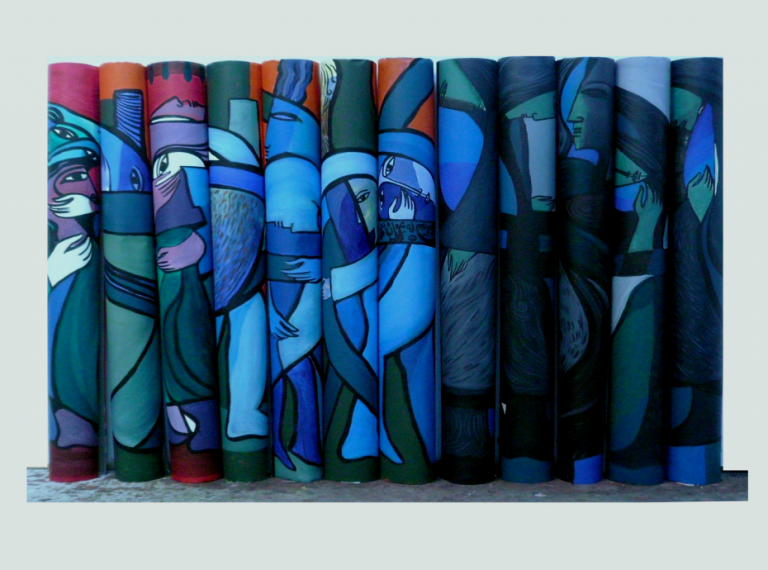 Rebwar Rashed,12 Months Diary, Biennale di Venezia, 2008, Acrylic on Canvas, 120cmx40cm,12 units, Photograph by Rebwar Rashed. This was followed in 2010 with a participation in an exhibition in Tokyo at the Kawasaki City Museum. I exhibited two projects, both a collection of paintings with the subject of my diary. In the first project – a collection of twelve works, representing one month each (the symbol of a circle) – I am inviting the visitor to look at my memories as images. The images are rolled up into scrolls to partially disclose and partially hide the image. As the scrolls touch one another, they continue their story (see Illustration 12). The second project continues the same idea, but uses 31 scrolls for each day of the month of May (Illustrations 13 and 14). (Illustration 13). Rebwar Rashed, Month of May Diary (detail), Kawasaki City Museum, 2010, Acrylic on wood, 6x12cm, 31 units, Photograph by Rebwar Rashed. (Illustration 14). 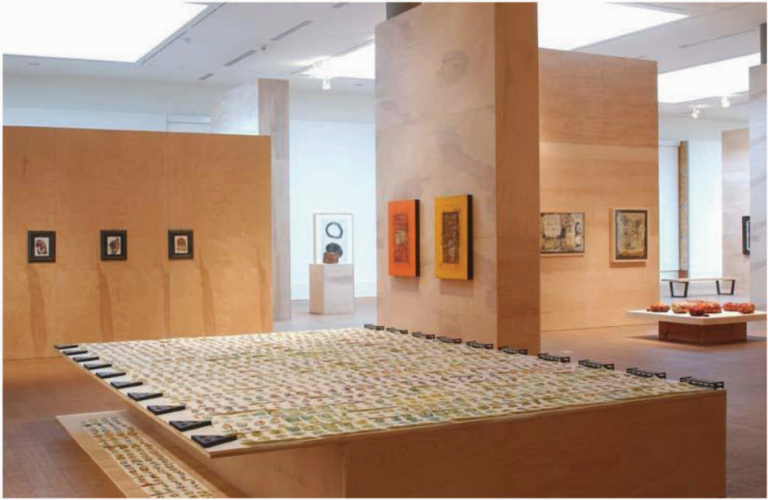 Rebwar Rashed, Month of May Diary, Kawasaki City Museum, 2010, Acrylic on wood, 6x12cm, 31 units, Photograph by Rebwar Rashed. The museum, designed by Le Corbusier, housed many sculptures by European artists like Henry Moore, Max Ernst and Alberto Giacometti. The art association La Pluie d’Oiseaux was established in 1991 in Lille, France, with two other artists (Edith Henry and Karina Waschko). 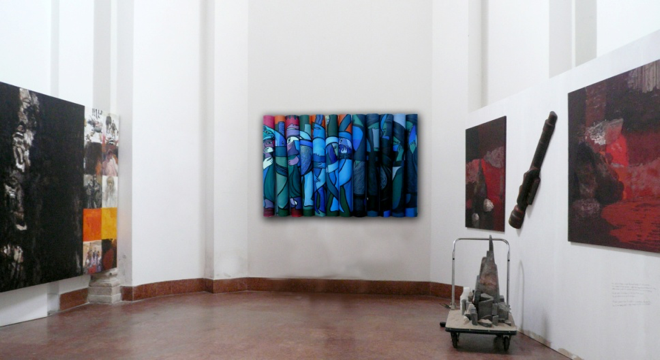 Its objective is to create encounters between cultures and between the different fields of arts. 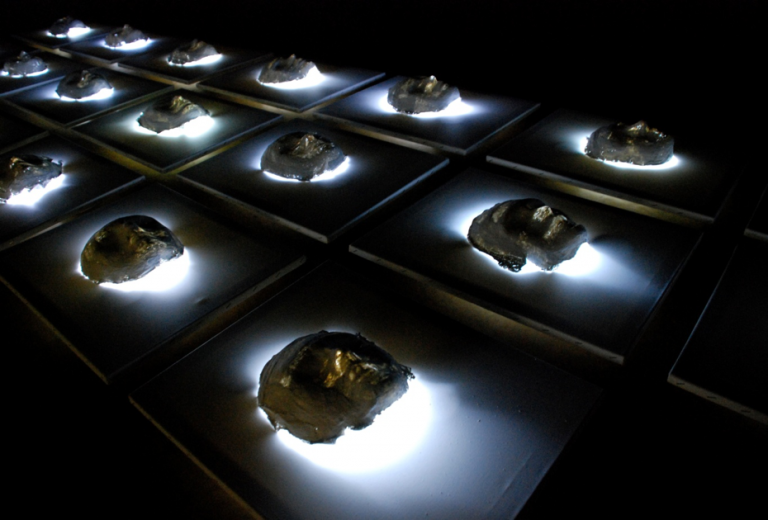 The association creates and distributes exhibitions and shows, organises artists’ residencies, workshops and events. The association is developing ‘The Donation’ that is both a collection of works of contemporary art for the museum of Suleimany and a principle of artistic exchange, with a vocation to create a dynamic for artistic encounters between Europe and Iraqi Kurdistan. Mirawdali, Kamal, Passage to Dawn, (London Millenium Award, 2002), p110. Sontag, Susan, , Regarding the Pain of Others, (Penguin Books, 2003), p32. I will chart the origin and history of the project ‘Showering of Birds’ in more detail in a subsequent discussion. Pitts, Martin, Rebwar. Colour and Word, (London, catalogue published by Middlesex University, 2000), p65. One outcome of this project was an MA thesis by Rebwar Siweli at Copenhagen University, Department of Philosophy. Rebwar Siweli is now head of the Philosophy Department of University of Hawler, Kurdistan Iraq. He is one of the new generation of authors on social history and philosophy. Thompson, Jon, Rebwar. Colour and Word, (London, catalogue published by Middlesex University, 2000), p3. Schofield Sarah, The Kurdish Garden, exhibition catalogue, (Lyric Theatre, London, 2005), p 4.